“Since completing my studies in MA English and Culture, I have founded Parentheses Journal in December 2017. The journal is a labour of love I began with a co-artist, equally passionate to bring forth voices that are often ignored by mainstream academia and the arts. “At the moment, I am also working as a poetry editor for COUNTERCLOCK Journal based in Vermont, USA, as well as teaching undergraduate students various courses in the capacity of a visiting lecturer. 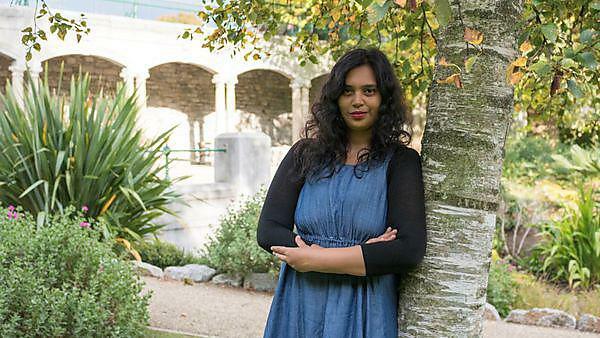 “I was awarded the prestigious GREAT scholarship to pursue my studies at Plymouth. My studies and research have often been undertaken by scholarship support, which was the main reason for my choice of university. I would recommend Plymouth because of its excellent facilities, the beautiful surroundings and more importantly the administrative staff support. “The presence of the Charles Hayne library, which is open all year, was another deciding factor, too. The library has been one of my best spaces of learning. "I spent many a weekend and evening looking over the shelves and learnt lots and have read extensively on inter-disciplinary subjects – including Chinese, Japanese and Pre-Raphaelite women artists. I have been a keen student of literature and these books have been of immense help. I carry my learning with me, which I hope will take shape in future research as well." "The International Student Advice (ISA) team led by Caroline Langmead is supportive and conducts many orientation events before the beginning of the semester. Every single staff in the ISA is kind and responsive. “I most enjoyed the ISA group meetings, conducted by the team every Wednesday. In this space, I met many like minded international students. “I would recommend the services of the ISA, as it is a one stop place for all of the needs of an international student. I wrote about it on my student blog as well, where I reflected on my time at the University. “I was also an active participant in the weekly meetings at the Careers and Employability service hub, where there was student discussions on how to improve the space and better the employment services for current and graduated students." “I have made friends for life in Plymouth. "Angie Smith, the head of the group, Caroline Langmead from the international student group, and Min Wild from the English department are staff members who I will always fondly remember. They have been immensely supportive in my journey. I have also made friends for life from my cohort in Kayleigh, and Davide Bertelli from the Student Union. “I am grateful to Georgia O’Carolan and Adam Read for their support when I worked with their team as a student blogger – they are friendly, communicative and encouraging. “I am thankful to have received a certificate after my nomination for the ‘Student Employee of the Year’ and for giving me a space for creativity. "I was also a member of the Black, Asian, and minority ethnic (BAME forum) at the Student Union, which was an enriching experience. “Another memorable experience was when I led creative writing workshops with science students for our University journal INK, where I also worked as a poetry editor and general adviser in 2017." “I am quite confident that the multicultural experience at Plymouth rewarded me with a space of much reckoning. I wrote extensively during my time at there – the University is a quiet space for those who wish to carry out in-depth research and to learn. “I have learnt to be more open and straightforward with my approach and areas of research interest. I have been conducting independent research and readings in the larger South Asian continent and exploring newer voices in literature that need to be brought centre stage. Study literature and culture through an exciting variety of thematically conceived modules on the MA English Literature programme. Drawing on staff expertise, the programme covers a broad range of periods from the early modern period to the present. On this diverse and challenging degree you’ll gain advanced research skills, which you’ll apply throughout your studies and beyond. Learn more about an existing area of interest, or discover something on our highly adaptable and varied MA.